Delaware: Healy Consultants’ Go To State for Incorporation in the USA. Delaware: Healy Consultants Group PLC’ Go To State for Incorporation in the USA. What makes Delaware so special? It’s the second smallest state in the US but is considered the corporate capital of America. Home to DuPont, one of the largest and most profitable companies in the world. DuPont started out as a gun powder mill in 1802, but is now best known for its innovative chemical materials that are used in everything from fertilizers to sportswear. DuPont was ranked 174th out of 2000 in Forbes’ global list of top public companies in 2015. 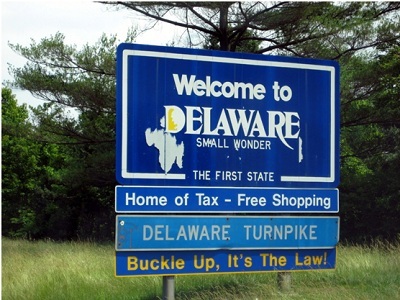 Delaware has very favourable tax laws for corporations who earn income outside the state. According to About Agency, “More than 1,000,000 business entities have made Delaware their legal home. More than 50% of all publicly-traded companies in the United States including 64% of the Fortune 500 have chosen Delaware as their legal home.” Companies incorporated here include American Airlines, Bank of America, Google, Apple, Cargill, Coca-Cola, General Electric, Ford and Wal-Mart. Advantages of setting up in Delaware include having to pay no state tax if your profit-generating operations are not in the US. A business licence is not required for foreign ownership and stock owned by non-resident shareholders is not subject to inheritance tax. Intangible personal property such as intellectual property, copyright, trademark, goodwill or even research and development operations owned by a company incorporated in Delaware are not subject to state tax and these operations can even be used as tax deductions in other states, further reducing your tax burden. Another big advantage of incorporation in Delaware is that it does not carry the stigma associated with other tax free havens such as the Cayman Islands or Bermuda. Healy Consultants Group PLC has been assisting with company setup in Delaware for more than a decade and consider it an ideal way to legitimately book international profits without paying local state tax, provided that revenue is not earned in the US. A company setup in Delaware is relatively inexpensive and formalities take only a few hours without the requirement to travel. A director and shareholder are required but these can be the same person and details of these persons need not be disclosed to public. There is no share capital required and there are minimal registration costs. And if you run into trouble with your business operations, then Delaware delivers once again – Delaware is home to the Court of Chancery, arguably the most important business court in the US with over 200 years of experience presiding over corporate cases.